Advocate Health Advisors Launches Veteran Website. Veterans Will Help Veterans with VA and Medicare Benefits. TAMPA, FL - (May 25, 2017) Advocate Health Advisors is proud to announce the launch of AdvocateForVeterans.com, a website focused on empowering Veterans by helping them navigate the complex landscape of their specific healthcare needs. AdvocateForVeterans.com was launched as part of Advocate's Veterans Initiative Program. The site educates Veterans on how to maximize their VA benefits by showcasing information, available resources, and videos. "The videos, in particular, are powerful," said Darwin Hale, CEO of Advocate Health Advisors. "Veterans can watch these videos and see themselves or someone they know, these are real Veterans that Advocate Health Advisors has assisted with developing their personalized healthcare plan," said Hale. 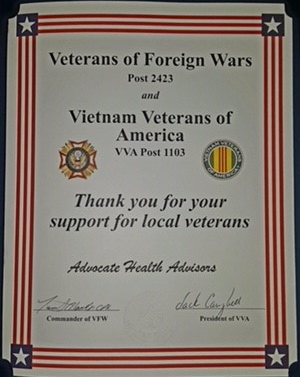 Advocate Health Advisors, a Veteran-owned healthcare organization committed to helping Veterans successfully navigate the healthcare system, was recently recognized for their support of Veterans by the Veterans of Foreign Wars (VFW) Post 2423 and the Vietnam Veterans of America (VVA) Post 1103 for their Veterans Initiative Program.